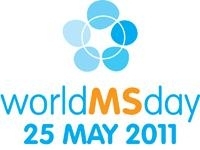 May 25th was World MS Day! It is about raising awareness and mobilizing the global movement. Multiple sclerosis (MS) is a chronic disease that attacks the central nervous system (CNS), which is made up of the brain, spinal cord, and optic nerves. Over 2,000,000 people in the world have MS. It is one of the most common disabling neurological conditions amongst young adults in the northern hemisphere.